The Wailea Resort sprawls across the lower slopes of the dormant volcano Mt. Haleakala on Hawaii's island of Maui. Within it are not one but five beaches, their crescents of soft sands framed by lava-rock promontories. Rising to more than 10,000 feet, Haleakala shields the resort from the rains that turn the opposite side of the island into lush rain forest. This western side of the island is, by contrast, quite arid, though within the resort the simple addition of water has created a verdant, flower-filled 1,500 acres of lushness containing an 11-court tennis complex, three golf courses, five beachfront hotels, multiple shops and restaurants, and hundreds of condos. The hotels naturally hug the coast where they front the beaches, whereas the Wailea Tennis Club perches about a quarter mile away and slightly uphill, where it has sweeping views of the famous whaling anchorage of Lahaina Roads and the West Maui Mountains. The requisite magenta bougainvillea spills down the lava-rock walls of its stadium court, which was cut into the hillside, and lines the walkways to the two-story clubhouse. That clubhouse juts straight out from the hill along one side of the stadium court. Its upper floor contains a very popular restaurant called Joe's Bar & Grill (which is open only for dinner) with views of the court and the mountains, while the pro shop is below. It's a pleasant setting but because it's removed from the hotels, you need to know it's there. Your hotel's concierge will no doubt tell you about it if you ask, but there may not be anything in your room to let you know tennis is an option. Tennis Staff. 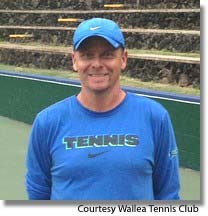 Tennis director Patrik Ekstrand came aboard in September 2013 as the new Director of Tennis. He is originally from Sweden, where he represented his country as a top-ranked junior and won two European Championships and two national junior singles titles. After coming to the U.S., he played for the University of Texas El Paso, earning two All-Conference player awards. Since then, he has spent most of his time teaching has been spent working with competitive juniors in both Texas and Sweden. Tennis Programs. Visit during any week, and apart from the option of private lessons with any of the three USPTA-certified pros on staff, you'll find daily clinics each morning as well as staff dedicated to finding you a game, if not with another hotel guest then with any of the club's members or its local stable of players on call. Apart from private lessons, most of the programming takes place during the week. Recently weekly mixers and events were introduced. Courts Fees. $20/person/day during the December-April high season; $15/person/day the rest of the year. Beach. Wailea has five beaches along a scalloped coastline accented by lava-rock outcrops. Golf Courses. Wailea's 54 holes of golf drape the lower slopes of 10,000-foot Mt. Haleakala, providing vistas of the Pacific Ocean off to the west. Gold Course: Robert Trent Jones, Jr. designed this challenging 7,000-yard layout. Rugged and natural, it was named one of the best new resort courses by Golf Digest when it opened in 1994. Strategically placed bunkers and hazards, elevation changes, and several well-planned dog legs make it a thinking player's course. Its most unusual hazards, however, are low lava-rock walls built by the early Hawaiians, who called them papohaku. Jones made sure they were preserved during course construction, which earned it awards for preservation. Par: 72. Length: 6,060-7,078 yards. Emerald Course: Lush and tropical this second Robert Trent Jones course shares his Gold Course's panoramic views and undulating terrain but is more forgiving. Flowers abound, adding to what is in any case an enjoyable outing. There are 4 to 6 tee boxes on every hole, allowing you to tailor the challenge to your skills—or to how well you're playing that day. Par:72. Length: 5,785-6,825 yards. Blue Course: The first course to be built at the resort, this Arthur Jack Snyder design introduced lush fairways into the into what was formerly an arid scrubby landscape. A true resort course, it meanders among houses and condos and provides a measure of forgiveness in its wide fairways and large greens. Par: 72. Length: 5,291-6,758 yards. Spa & Fitness Center. The Grand Wailea Resort Hotel, the Fairmont Kea Lani Hotel, the Four Seasons Resort Maui at Wailea, the Wailea Beach Marriott, and the Andaz Maui at Wailea Resort all have full-service spas as well as fitness centers, while the Residence Inn by Marriott has a fitness center. There are five beachfront hotels within Wailea and numerous condominium complexes. Lodging consists of rooms and 1-, 2- and 3-bedroom suites. Some of these are in the Napua Tower, a 100-room small hotel within the resort. Rates are subject to Hawaii state taxes. Numerous packages are available as well. Rates for suites and villas vary according to size and view. Numerous packages are also available. All the rooms are suites, ranging in size from studios to two bedrooms and having kitchens. It is situated back from the beach, not far from the Wailea Tennis Club, where its rooms variously have views of the island or full or partial views of the ocean. See the website for details about rates during the period you want to visit. Travel Instructions. The nearest airport is Kahului, 17 miles north of the resort. The drive to the resort takes about one hour. You'll leave the airport via Keolani Place. Stay left onto Hwy. 380 (Dairy Rd. ), then turn left at the third light onto Hwy. 350/311 Mokulele Hwy. That will curve to the right past the Puunene Sugar Mill and continue roughly 5½ miles and then turn left onto Hwy. 31 South (Pi'ilani Hwy.). Follow that for about 7 miles, at which point Hwy 31 ends and you curve right onto Wailea Ike Dr. Turn left at the stop sign onto Wailea Alanui Drive for all of the hotels except the Wailea Beach Marriott, which is just to the right.